If you have got a 3D camcorder like Sony HDR-TD10, HDR-TD20VE, JVC GS-TD1, Panasonic HDC-SDT750 or Panasonic AG-3DA1, etc and recorded lots of 3D AVCHD MTS/M2TS files, you may want to watch the recorded 3D videos on HD TV, portable devices or just want to import these 3D AVCHD files in some None Linear Editing software like Final Cut Pro (X/7/6), iMovie, FCE, Avid MC, Adobe Premiere, Sony Vegas, Pinnacle Studio, etc for advanced editing. However, the 3D AVCHD MTS footage is not that easy to handle. In fact, between 3D AVCHD video and regular AVCHD video, the camcorder happens to have two lenses next to each other and the two images are recorded to the single storage media. Most users found that even some video editing programs like Adobe Premiere Pro can recognize the 3D video, but Premiere only shows the left-eye image, not the whole images. In this case, we recommend you a quick workaround to transcode 3D AVCHD MTS/M2TS files to a proper format for easy playback or editing with UFUSoft 3D AVCHD MTS/M2TS Converter. UFUSoft 3D AVCHD Converter will be the perfect complement to play/edit 3D AVCHD MTS/M2TS files on Windows and Mac. The program helps to convert Sony/Panasonic/JVC Everio AVCHD 3D mts m2ts files to all common format files such as AVI, WMV, MP4, MOV, MPG, MPEG, 3GP, 3G2, FLV, MKV, VOB, etc and HD formats including HD AVI, HD WMV, HD MPEG-4, HD MPEG-2, HD MKV, ProRES 422 MOV, AIC MOV, DNxHD MOV, etc. Then, you can easily play AVCHD 3D on QuickTime, import/edit AVCHD 3D with Windows Movie Maker, Sony Vegas, Adobe Premiere Pro, Adobe After Effects, iMovie, FCE, FCP 7/FCP X, Avid Media Composer. Or transfer/play to your iPad, iPhone, iPad, Apple TV, Android Phone/Tablet, Windows Phone 8, PSP, PS4, Xbox 720/360, etc. How to Convert and Import Sony/Panasonic/JVC 3D AVCHD MTS/M2TS on Windows or Mac? 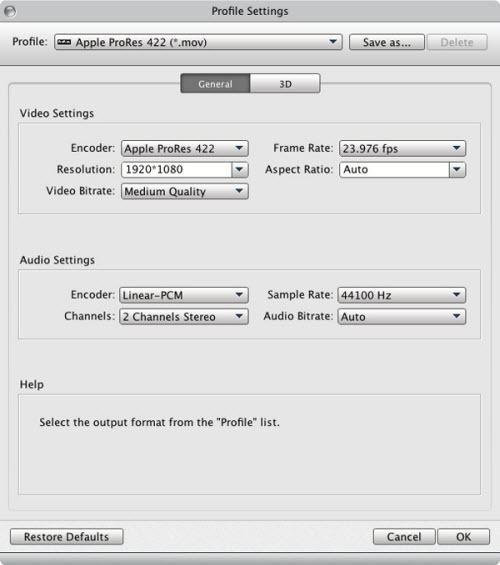 Step 1: Launch AVCHD 3D Converter on Mac, and then click the “Add” button to load the 3D .mts or 3D.m2ts videos. You can also use the drag-and-drop method to load the 3D AVCHD (*.mts, *.m2ts) files to the application UI. Tip: If you want to merge multiple 3D AVCHD mts or m2ts files into one for easy editing, please select all files and click Merge to merge all the imported 3D AVCHD MTS clips. Step 2: Click the Format bar and choose a decent format as you need. For example, Final Cut Pro -> Apple ProRes 422 (*.mov) for FCP X/7/6; ”iMovie and Final Cut Express–> Apple Intermediate Codec(AIC)(*.mov)” as the output format for iMovie 8/9/11 or FCE 4; ”Adobe Premiere/ Sony Vegas -> MPEG-2 (*.mpg)” is the best format for Premiere, Vegas editing. If you want get common MP4 files for playback, you can choose “Common Video -> H.264 Video (*.mp4)”, etc. Tip: You can click settings button to adjust the output parameters, such as resolution, bitrate, etc. Tip: Edit your 3D AVCHD Files (Optional) : If necessary, click option under “Edit” icon to start video editing with your 3D AVCHD files. The supporting editing functions include the cropping frame size, trimming the length, adding watermark, and so on. Step 3: Click the convert button, the 3D AVCHD converter will start encoding the 3D AVCHD .mts/m2ts files immediately. After the files are converted, tap the Open button to loctae the converted files and bring them into your video editor, edit, export or share.